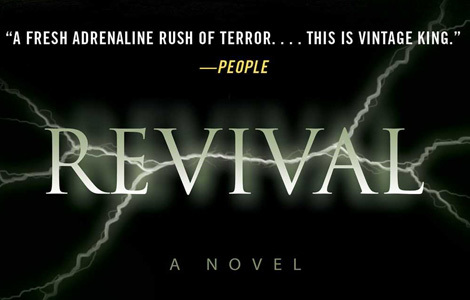 Stephen King’s Revival spans about five decades, telling the story of a boy, Jaime Morton, who grows up to become a musician who becomes a drug addict who becomes an ex-drug addict who basically goes on with the rest of his life. But it’s intertwined with:. It’s also a look at the personal journeys we all take during the various stages of our lives, along with a love-letter to rock and roll of the era in which the author grew up. The question is, can it be all these things at once? Yes and no. There’s a real challenge to writing a story encompassing such a long period of time, and from the point of view of only one character. It essentially reads like an autobiography of Jaime Morton. Since it’s fiction, Jaime is new and not someone famous or historically important. The challenge then is to successfully draw the reader into the entire life of this character. Early on, the story is largely successful, creating a small town and small-town family. The coming-of-age adventures of the Jaime are relatable and poignant. The town’s new preacher arrives with his family, but a tragedy strikes, setting into motion the direction that both the Reverend Jacobs and the Jaime will follow as they cross paths again and again throughout their lives. Every time they do, things get stranger. Jaime knows Jacobs is up to something beyond imagining. Unfortunately, he can’t figure out what. That isn’t to say it’s boring or otherwise uninteresting. Everything does work together. The characters are multi-faceted, leading to real drama. There are layers of mystery and, or course, moments of dread and creepy happenings. And there’s purpose to it. It’s a story with heady themes about addiction and fanaticism. But I am not sure fanaticism is the right word. Obsession might be better. Revival actually made me think of Indiana Jones and the Kingdom of the Crystal Skull (yeah, I liked that movie, what are you going to do about it?). In that movie, the Russian agent is obsessed with the mind, with knowing the hidden secrets of the universe. Knowledge is power and she wants to all of it. …Until she gets it. But it’s too late then, isn’t it?